Amber and the Antlers are a TOP NOTCH operation. EVERYONE was kind, wanting to help, polite, and really did care that you had the best night of your life. The Antlers is a hotel that has an ambiance second to none. All and all would not give one bad rating for this hotel as they went above and beyond for my wife and I. We appreciate the great review and wish you and your wife a lifetime of happiness! They were always there for assistance when needed! Whether it was more rooms that needed to be booked to adding more tables and chairs for our wedding reception. A special shout out to Amber, the catering manager, who went above and beyond my expectations to help make my wedding very special! We are glad that we got to be a part of your special day and glad that we were able to exceed your expectations! I primarily dealt with the Catering Sales Manager, Michael Wicinski. He was very easy to work with and was quick to respond to emails and voicemails. There was a hiccup regarding having the wrong credit card charged by the accounting department but they quickly corrected this. 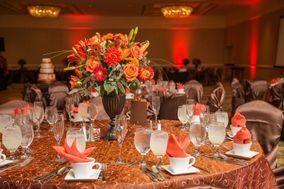 Overall we had a wonderful experience and a pleasant staff that worked our wedding reception. The food was great and our guests had fun! It was a pleasure hosting your wedding ceremony and reception and I am glad that you and your guests enjoyed the Antlers Hilton. We wish you both all the best! We had 55 rooms reserved at The Antlers Hilton for our son's wedding. The staff was great ahead of time with setting up our reservation link, answering questions, keeping us informed about reservations, and increasing the number of rooms we had available to us. They also gave us a hospitality room to gather in. We hosted a brunch the morning after the wedding that was fantastic. Everyone we encountered from the bellman and front desk staff to the wait staff and housekeeping was friendly, helpful and always asked what they could do for us. If you are looking for a place in downtown Colorado Springs for your guests to stay you don't need to look further than the Antlers Hilton. It was a pleasure hosting your family & guests for your son's wedding and we are glad that everyone enjoyed their stay at the Antlers Hilton! The staff is absolutely top notch. I have only positive things to say about them. The food was also outstanding. It is still a bit pricey for off season but, I do understand it was around Christmas and holiday parties but, off season for weddings. The Antlers is a lovely venue. The food was amazing and the tables looked great. It was classy. They have a HIGH staff turnover. I worked with 3 Catering managers while planning my wedding. That was a downfall, because the day of the event they had the dinner time wrong, and forgot the Appetizers. But when I asked, they fixed it right away. So in the end everything turned out lovely. They do serve some of the best food in town. And the cake was amazing! Everything turned out great at the Antlers...the food and environment were exceptional. Be prepared to spend a pretty penny though! It was difficult to find a nice venue for our reception that was large enough to accommodate our guest list. We were working with a limited budget, but we still wanted a nice venue. The Antlers Hilton has a nice ballroom and the food was great! The price is a little more than some of the other venues in town, but worth it for the hotel option. We had a few problems with set up time. The Antlers only allows a one hour window for set up and the window is one hour before the ceremony. Unless you have a wedding planner or a willing friend to take care of this detail, it may be impossible to set up. We also had problems getting our cake cutting set and flutes back from the hotel. Overall, the experience was good, and we had a lovely reception. Since our wedding, several other venues have opened up that I would recommend over the Antlers. This venue was a nice alternative to a church wedding.